Chopped Chicken Taco Salads with Cheese Quesadilla Strips. I made us more salad! More CHOPPED salad, to be exact. My favorite kind. Everything is in little bits and oh-so cute. However… if you came over for lunch, I doubt I’d ever make salad because entertaining people is the perfect excuse to eat something rich and delicious. Calories don’t count when eaten with friends. I’m thinking pizza. 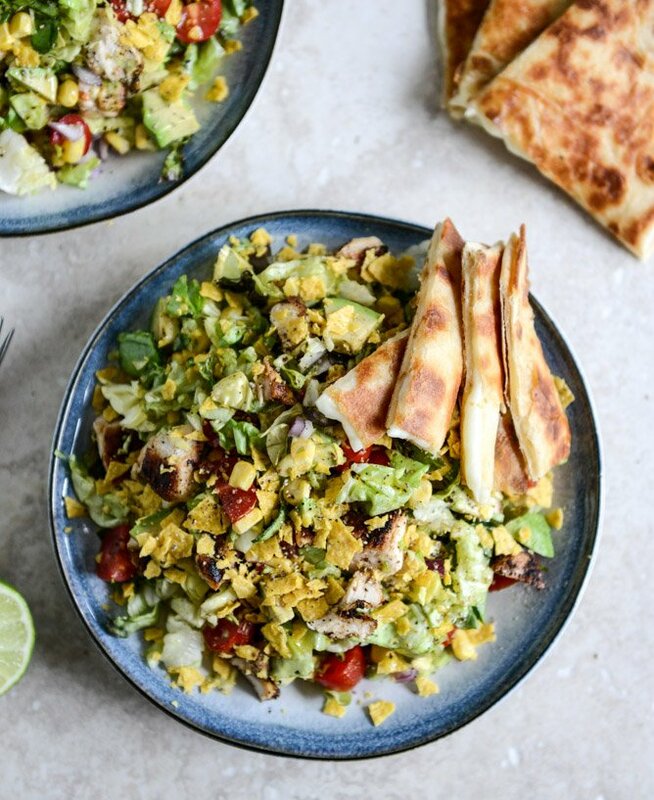 If you haven’t figured it out already, this is sort of my copycat version of Chili’s quesadilla explosion salad, which I haven’t had in eons but used to loooooove. I mean, I was eating that back in the day long before I was consuming vegetables, which makes perfect sense since it now always tops the lists of those “highest calorie foods” and “things to avoid at chain restaurants” and [insert scary music here] “salads that aren’t what they seem.” Whatever. That’s why it was so good. I used to love going to Chili’s for the chips and salsa but three or four years ago, after driving around for an hour and not really knowing what we wanted to eat (know that feeling? ), my husband and I ended up there and had one of the worst meals of our lives. Which rarely happens because surprisingly, I am not a high-maintenance restaurant eater. Unless it’s at brunch. So we haven’t been back since and more than once I have wanted one of those salads. Mainly for the quesadillas. Of course. Also, don’t listen to me, because this isn’t a copycat version at all, it’s just my version. You know I like to make stuff up. 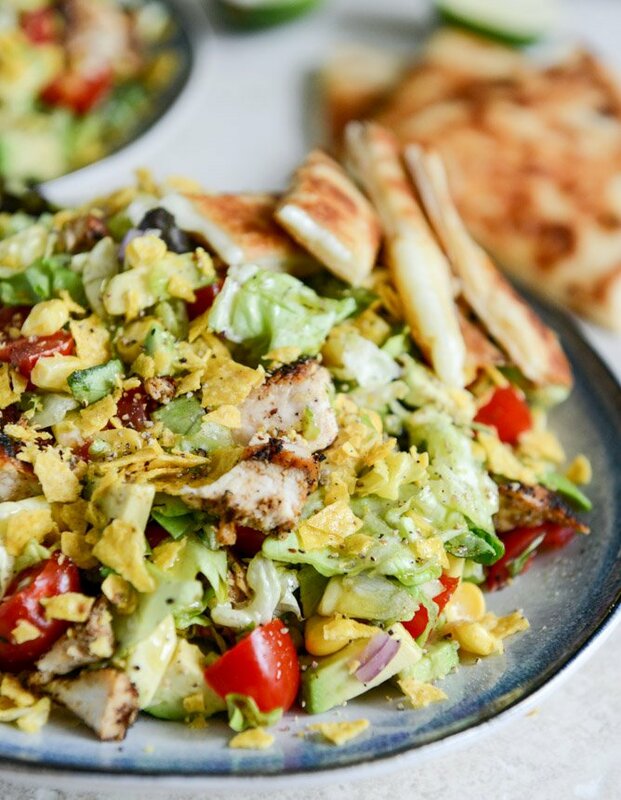 There are a ton of ingredients here, but I find they are all pretty necessary and “a ton” does not always equal “time consuming.” You’re gonna marinate you’re chicken overnight (or not), add your salad junk together, toss in a little dressing and crush tortilla chips over top. Now we are best friends. Right? The night before (or a few hours before) combine cumin, paprika, chili powder, salt and pepper in a small bowl. Add chicken to a large ziplock bag or baking dish and cover with olive oil and lime juice, then add in garlic. Sprinkle seasoning over top and marinate in the fridge for 2-24 hours. When ready to make the salads, heat a large skillet over medium-heat heat and add a little olive oil. Sear chicken both sides then reduce heat to medium-low, cover and cook until chicken is cooked through. Additionally you can bake or grill the chicken – whichever you prefer! Once chicken is finished, let cool for a few minutes and then cut into chunks. While the chicken is cooling, add a tortilla to the same skillet (add a little olive oil or butter if you’d like, then add the grated cheese and the second tortilla on top. Cook until both sides are golden and cheese is melted, then remove from the skillet and slice into strips. 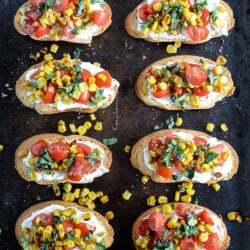 To make the salads, combine lettuce, tomatoes, avocado, corn and onion in a large bowl, then toss with the salt and pepper. Add olive oil, red wine vinegar and lime juice, tossing well to coat. Add in chicken and toss well, then separate on to two plates or bowls. Add crushed tortilla chips on top and quesadilla slices.